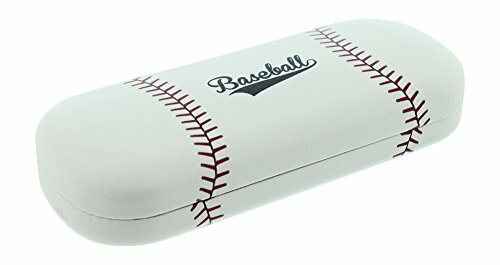 Protect your child's expensive eyewear in style with these sports ball themed hard shell eyeglass cases. The exterior features a printed finish of four different sports: Basketball, Football, Soccer, and Baseball. Each stylish case is of quality construction and has a strong metal hinge to keep your frames safely inside. The inside is lined with a matching plush styrene to help keep your lenses protected from scratches. Case fits easily inside a backpack or pencil bag for use at school. Exterior dimensions: 6.13 inches long, 2.5 inches high, and 1.25 inches deep. Interior dimensions: 5.5 inches long, 2 inches high, and 1 inch deep. These cases make the perfect accessory for any pair of children's small eyeglasses, reading glasses, or sunglasses. Hand packed with care in Dallas, Texas. If you have any questions about this product by Cal Optix, contact us by completing and submitting the form below. If you are looking for a specif part number, please include it with your message.